Cherrie Moraga visited UCSC last Thursday evening to reflect on the influence writer and UCSC alumna Gloria Anzaldua had on her writing. This was the first talk of the winter Living Writers Series . On the night of Jan. 13, the Humanities Lecture Hall filled up earlier than usual leaving many sitting on the stairs. 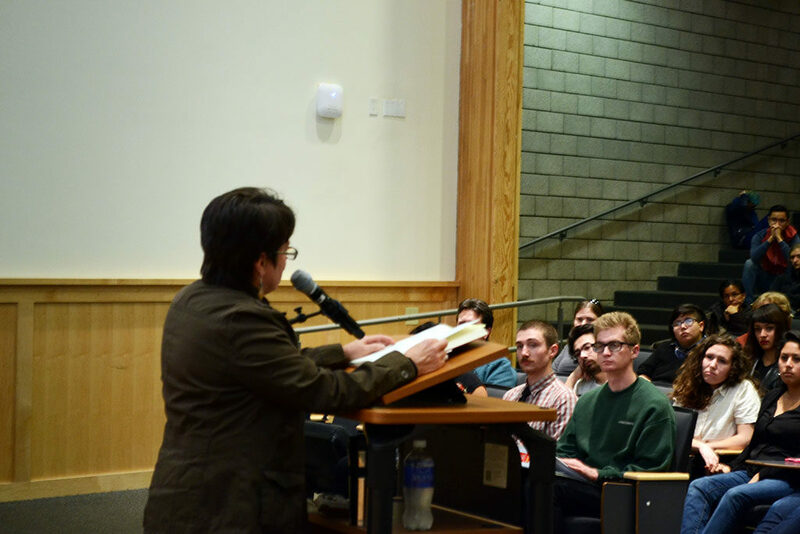 Students were ready to hear from Cherríe Moraga, a lesbian poet, playwright, essayist, editor, teacher and activist. Moraga, now a professor at Stanford, impacted the literary world through an emphasis on different identities. 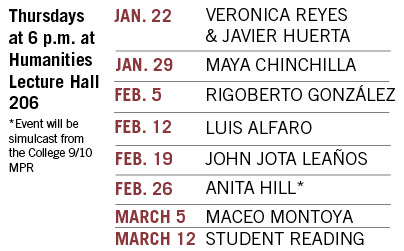 This quarter, the Living Writers Series is dedicated to the 10th anniversary of the death of Moraga’s colleague, Gloria Anzaldúa. A former UCSC professor and alumna, Gloria Anzaldúa was a self-described “chicana dyke-feminist, tejana patlache poet, writer and cultural theorist.” This quarter’s series is presented by the UCSC literature department and the creative writing program with additional sponsors. “We lost someone creative whose contributions to poetry and wider political thinking were very important,” said literature and creative writing professor and host of the series Karen Tei Yamashita. Gloria Anzaldúa devoted her life to writing and was also one of the pioneers of Chicana/lesbian/feminist theory. Her writing blends styles, cultures and languages by weaving together poetry, prose, theory and experimental narratives. Anzaldúa was author of “Borderlands/La Frontera,” a book of essays and poems that challenge various forms of invisible “borders” that divide opposing groups, such as heterosexual and homosexual, Latina/o and white, etc. She also co-edited “This Bridge Called My Back,” an anthology of writings by women of color, with Moraga. Both novels legitimized the experiences of women of color in academia in a way that had not been done before. Their work impacted both communities of women of color and queer women worldwide. As Moraga walked toward the podium, she said a few words in honor of her old friend and colleague Anzaldúa. “Borderlands/La Frontera was created because she wanted to change the world,” Moraga said. She explained that Anzaldúa’s use of language and themes of resistance to oppression reflected the divisions the border imposed on her as a Chicana living in south Texas. After reading poems from her book, “A Xicana Codex of Changing Consciousness,” she talked about 9/11, the increase in urban violence and the forms of dehumanization faced by both women and men of color. Moraga also opened up about the grief she felt before and after losing her mother to Alzheimer’s. When the memories she shared felt too serious, she encouraged the crowd to laugh with her to ease the tension. Throughout her speech, Moraga emphasized the importance of women of color feminism relating back to her writing and self-expression.